Normally, your Nikon D7100 captures photos using the entire image sensor, which is the part of the camera on which the picture is formed — similar to the negative in a film camera. However, you have the option of telling the camera to record the picture using a smaller area at the center of the sensor. When you use this alternative setting, the result is the same as if you shot the picture using the entire sensor and then cropped the image by a factor of 1.3. 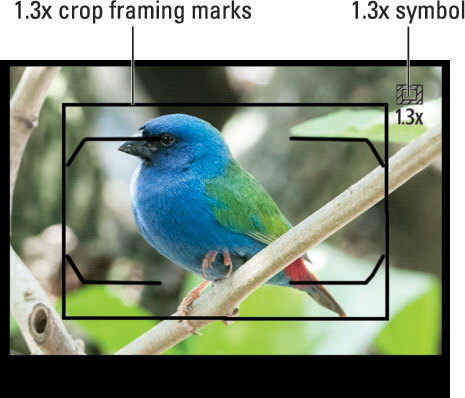 If you opt for the 1.3x crop setting, framing guidelines appear in the viewfinder to show you the image area that will be captured. You also see a little crop symbol in the upper-right corner of the viewfinder. What’s the point, you ask? Well, the idea is that you wind up with a picture that has the same angle of view you would get by switching to a lens with a longer focal length. In simplest terms, your subject fills more of the frame, and less background is included. To put it another way, you can think of this option as providing on-the-fly photo cropping. Of course, because you’re using a smaller portion of the image sensor, you’re recording the image using fewer pixels, so the resulting image has a lower resolution than one captured using the entire sensor. The higher the pixel count, the larger you can print the photo and maintain good print quality. On the flip side, because the camera is working with fewer pixels, the resulting file size is smaller, and it takes less time to record the image to the camera memory card. You also can capture more frames per second when you set the Release mode to the Continuous High or Continuous Low options. Information display control strip: After displaying the Information screen (press the Info button), press the i button to activate the control strip at the bottom of the screen. Highlight the Image Area setting, as shown on the left, and press OK to reveal the screen shown on the right. Fn button + command dial: By default, the Fn button is set to provide access to the Image Area setting. Press the button while rotating either command dial to toggle between the DX and 1.3x settings. As you change the setting, the viewfinder display, Information screen, and Control panel display the selected sensor size (24 x 16 or 18 x 12). 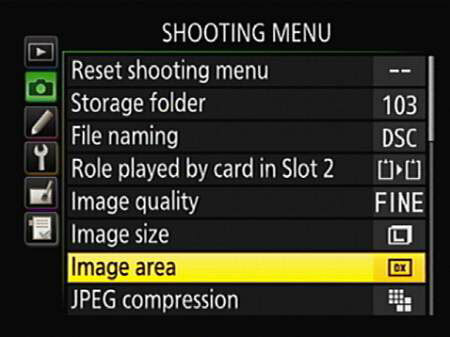 Shooting menu: You also can adjust the setting via the Image Area option on the Shooting menu.